Good morning and Happy April everyone! ... namely that we have decided to change Zantarni's look. Specifically, instead of our more realistic 3-dimensional avatars and items, we will be simplifying Zantarni's look and adopting what we hope is a more "approachable" look and feel to our avatars, items, and site. This means we'll be slowly redesigning our existing items to be more consistent with the new site look, and making other necessary changes as we go along. Obviously, implementing this rather ambitious decision is going to take some time, so the Staff and I ask your patience and understanding as we push forward with these design changes. ... and all of this leads me to this month's DIs, which not only feature one of our long-standing member's item design ideas, but are the first two sets of items that reflect Zantarni's new look. So run on over to the Gem Shop and pick up a couple gems so that you can buy these DIs! Bo...is conflicted. Or maybe confused. Probably both. This is a huge change for the site and Bo is definitely interested in seeing how it turns out in real time. LOL! When are you not at least slightly conflicted and/or confused, Bo? 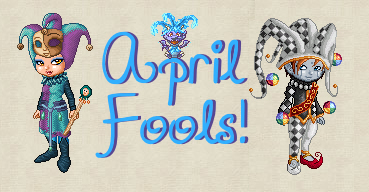 No offense to anyone, but I sincerely hope that changing the avatars is an April Fool's joke. I love our avatars and items the way they are. I always try to be positive, but, unfortunately, I'm not a fan of this idea. I do think there are things that could be done to improve the site, but, in my opinion, this should not be one of them. Zan's avatars is one of the biggest reasons I chose this site. The new look just looks too...I don't know what word I'm looking for...flat? I love you all though. I trust no one on this day. But I love this nonetheless. Here I am taking it all seriously but it probably is an April Fool's joke. No one else freaked out like I did. I'm afraid a flatter, more cartoon like look may be taken as just poorly made art by many. We love all the work you do for us, though, Queen Blazestorm. Bo still wants a baby goat pet. First of all, I love you all! ... and thirdly, yes, this is an April Fools' Day joke. I hope it didn't freak anyone out too much (Rayven)! And I hope you guys do like these items and that you enjoy them! I can't wait to see how you guys incorporate them in to your outfits and the rest of our items! Please know that I wouldn't do something like that to our cute little avatars - besides the logistical considerations (near impossible), I agree with you... it would be a biiiig step backwards for Zantarni... in a number of ways. ...and yes, Bo... the goat... I know... I know... jeeeze! Well, for starters, you know I'll share my thoughts...appropriate or not. I mean, you've already found my goat. BTW, you might want to keep an eye out for that goat... you never know where or when he'll show up! ... and thirdly, yes, this is an April Fools' Day joke. I hope it didn't freak anyone out too much (Rayven)! Yesh, I lost my mind for a minute Queen Blaze. I'm just glad that it was indeed a joke, and that you still love a panicked Rayven. Thank you for giving my heart some exercise.